Use just one USB3-AA-5M cable to extend one USB device up to 16 ft (5 m). Connect up to two USB3-AA-5M cables to extend one USB device up to 32 ft (10 m). Supports super speed (5Gbps), full speed (12 Mbps), and low-speed (1.5 Mbps) USB devices. Compliant with USB 3.0 specifications. One male USB Type A connector for host connection. Supports USB computers (PC, SUN, MAC). One male female USB Type A connector for USB device connection. 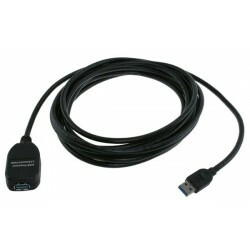 Provides support for super speed (5 Gbps), full speed (12 Mbps), and low-speed (1.5 Mbps) USB devices. Supports up to 150mA current for connected USB device. Length: 16 ft (5 m).